At Home Design Carpet and Rugs not only do we provide the best products, but also the best services. 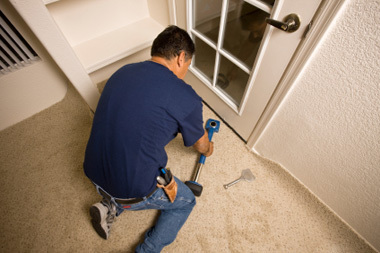 Our expert installation ensures that you get the most out of your carpet investment. Our professional and trusted installation teams are not subcontracted and each has over 25 years of experience. This experience ensures that your carpet and underpad will be installed properly; in fact, we guarantee it! We install both commercial and residential carpets and do everything from bedrooms to basements and also specialize in staircase runners. In addition to installation we can also remove and dispose of your existing carpet and under pad and we are happy to provide furniture moving if it is required. Under pad or cushion is an essential part of your carpet’s appearance and comfort. Not only does under pad help to absorb foot traffic, which reduces matting, it also helps ward off stains and diminishes odour. This helps to maintain your carpet’s original appearance. The under pad also plays a crucial role in how your carpet feels by providing extra cushioning. We carry a wide variety of quality pads including the STAINMASTER brand. STAINMASTER is the carpet industry’s most trusted and known brand and that is why we carry STAINMASTER underpad at Home Design Carpet and Rugs. The exclusive Hytrel system provides a ventilated moisture barrier which works to keep spills and stains from the carpet’s cushion. In addition, Odor Guard Technology helps to eliminate unpleasant odours. All STAINMASTER products are environmentally friendly, made with 100% recycled urethane and Hypoallergenic.